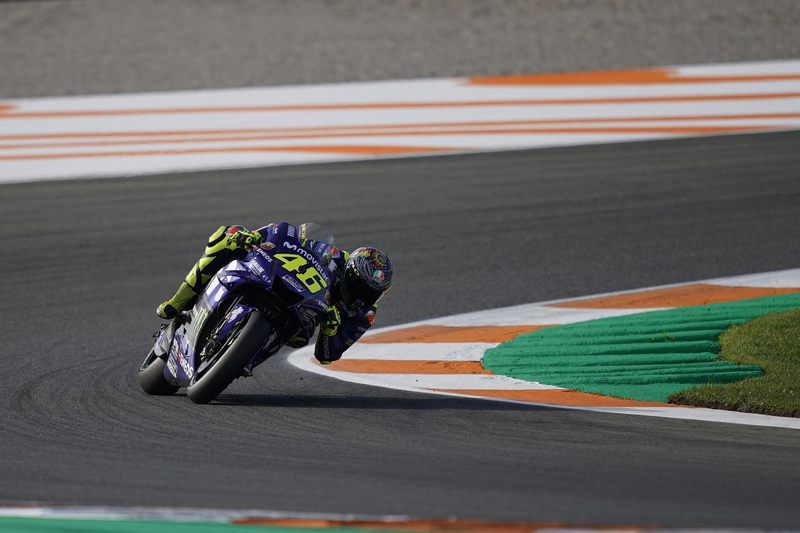 Tuesday saw the beginning of the 2019 MotoGP season, as preseason testing started for the premier class in Valencia, following the conclusion of the 2018 World Championship on Sunday. There was plenty to see: the Ducati GP19 had been highly praised ahead of the test; Jorge Lorenzo (Repsol Honda) would get his first taste of the Honda RC213V; Yamaha had two new engine specs to try in their search for tyre life; Franco Morbidelli (SIC Racing Team ) took to the Yamaha M1 for the first time; Danilo Petrucci moved to factory Ducati; Johann Zarco moved to KTM, as did Tech 3; and there were four rookies getting the chance to try out MotoGP machinery for the first time. However, things did not go the way the teams would have liked. The first part of the morning was unusable for them because of overnight rain. Zarco was the only rider to go out before the track dried, but only for a couple of laps. Eventually, the track dried and the riders were able to get their 2019 campaigns underway. Starting with Ducati, they did not manage to get much of anything done on the first day. Andrea Dovizioso spent the time he had making a base setting with the GP18, since he did not have the opportunity to run in the dry in the weekend. This was the same for everyone, of course, but the time Dovizioso spent on the 2018 bike meant he did not get to try the GP19 until Tuesday. It was the same situation on the other side of the garage, as Danilo Petrucci was acclimatising to his new box, and new team. That said, when they got around to the new bike, Dovizioso was enthused by what his team had discovered, and Petrucci essentially said the GP19 was perfect. Nonetheless, the next test in Jerez will be important for the factory Ducati team to confirm what they found in Valencia, and to determine their direction for the winter before Sepang. Jack Miller (Alma Pramac Racing) was also highly impressed with the first version of the GP19, saying he couldn’t understand how it was derived from the GP17 he has ridden in the 2018 season. Miller noted that the biggest thing with the new bike compared to the 2017 Desmosedici was the ease with which the 2019 bike changes direction. They have only had one day on the GP19 so far, but already the three factory Ducati riders look strong for the new season. The factory Yamaha squad’s entire focus over the course of the test was on the two new engine specs they took with them. On Monday, the focus was on an engine which they had already tried at Aragon. Both Valentino Rossi and Maverick Vinales were happy with the engine, especially Vinales who was particularly enthusiastic about the engine braking. Rossi reflected Vinales’ opinions, but was more realistic in insisting that there is still work for Yamaha to do before they’ll be in a position to fight consistently. A newer engine spec on the second day seemed indifferent to the one tried on Monday. Vinales could not decide which he preferred, whilst Rossi didn’t seem too happy with either of them. Whilst both of these engines helped in the engine braking, they were still not helping with the acceleration or the tyre life either. However, both riders were happy with the direction after a 2018 season plagued with technical issues. Yamaha also had Jonas Folger out for his first MotoGP experience since September 2017. Whilst the German’s work in these two days was perhaps not so important, he could be critical for Yamaha come the middle of 2019. Marc Marquez during the Valencia Test. Photo curtesy of Repsol Honda Team. Honda face a difficult winter, and Valencia was the beginning of that. Marc Marquez is injured, as is Jorge Lorenzo (who is new to the bikes) and Cal Crutchlow (LCR Honda) who may still be unfit come the Sepang tests in 2019. Stefan Bradl was on the LCR Honda on Tuesday, but was just testing different suspension, whilst Takaaki Nakagami (LCR Honda) got his hands on 2018 HRC machinery, and was somewhat taken aback by the progression made from 2017 to 2018. Marquez was limited in his track time, due to that injured left shoulder, but had three bikes to test. One was the 2018 spec, there for comparison, and then he had two black bikes, which were 2019 prototypes. 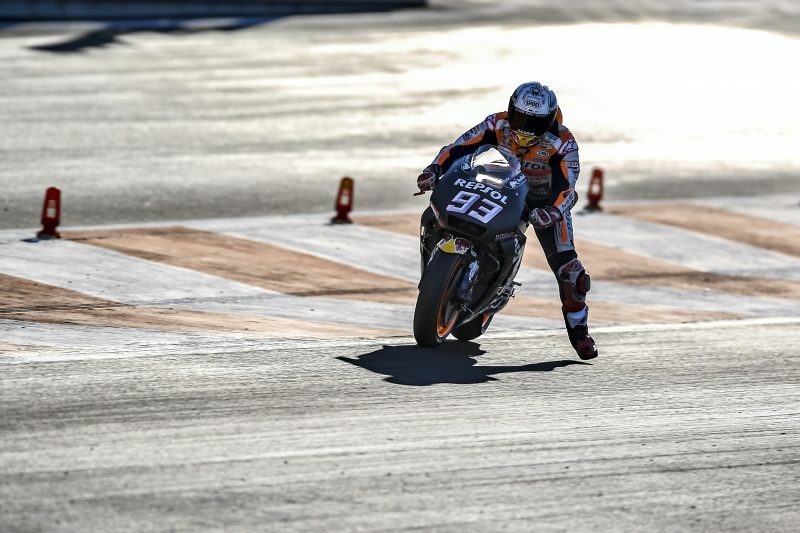 Marquez couldn’t say much of his testing, but it seemed as though at least one new engine spec was there for him to try. There was also a new chassis for Marquez to try, but because of limited track time, he and Honda will need to use the Jerez test next week to confirm their feelings from Valencia. Like what you just read? Then follow us on Twitter (@CrewOnTwo) for article notifications and all things two-wheeled.